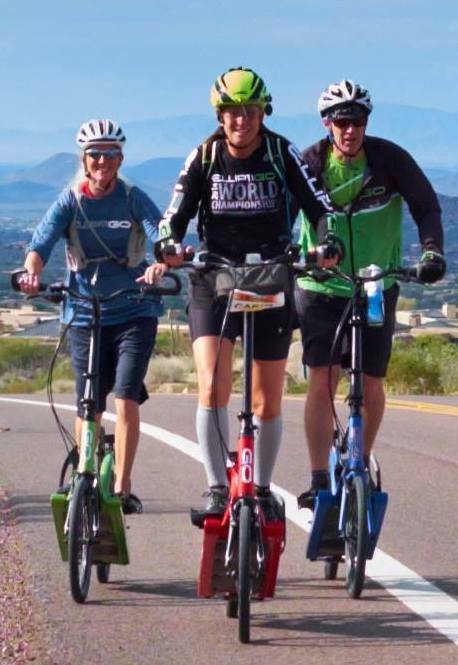 Join ElliptiGO riders of all levels from across the country for a weekend of riding, socializing and FUN! Choose 1 of 3 routes each day depending on how you’re feeling; no rider left behind!! Middle distance & short distance routes will have a lead GO & a sweep GO. The Advanced, long route will be self-supported. All routes are either out & back or a loop so we start & end at the same location. 2. (optional). There will be a limited number of ElliptiGOs available for rent. To reserve a GO, please send an email to keri@elliptigo.com. 3. (optional). The host hotels are the Sleep Inn and Hampton Inn and Suites, Scottsdale. To reserve a room, see additional details here. 6:00AM-8:30 – Breakfast on your own. Host hotels include a complimentary hot breakfast with your room reservation beginning at 6AM. There are many other local breakfast options nearby & also at our meet up location. *Rented ElliptiGOs will be transported to/from the rides each day. If you’ve rented an ElliptiGO, please plan to be at Big Earl’s well before your ride time. “Bartlett Lake” out & back: 45 miles / 4500 feet of elevation gain / lots of climbing – this is a physically challenging ride & will be self-supported without a lead or sweep GO! Choose this beautiful ride if you’re an experienced, conditioned climber looking for a challenge! Please plan to arrive back at Big Earl’s by 12:30PM for lunch. “Seven Springs” out & back: 25 miles / 2300 feet elevation gain / moderate climbing, rolling hills & a few short steeper hills in the 4 miles before the turn around point. Long, beautiful descent on the way back! “Lone Mountain/Legend Trail” loop: 19 miles / 950 feet elevation gain / low grade incline first 4-5 miles. More stops to rest along the way and we’ll take our time! Uncorked is walking distance from host hotels or utilize the hotel’s free shuttle service if you prefer a ride. Guests of participants are welcome to join us. We’ll all sit together & enjoy dinner from a variety of Uncorked favorites so whether you prefer a light bite, shared plates, appetizers or a hearty dinner, they’ll have it on our customized menu! For our convenience, Uncorked will provide separate checks so please wear your name tags to dinner to help them out. 7:00AM-9:30 – Breakfast on your own at one of the many nearby restaurants or the host hotels include a complimentary hot breakfast with your room reservation beginning at 6AM. 10:00AM – Event participants/riders begin arriving at our ride meet up location: Note: Rented ElliptiGO’s will be transported to/from the rides each day. We’ll be riding in an 8-mile loop or choose one of the paved shared paths from the trailhead to explore. You can GO as much or as little as you like. Stop to take photos; do one loop or several … it’s up to you! Just have fun and enjoy the ride with a fun group of GOers!! (Guests of participants are welcome) A convenient walk across the parking lot from the host hotels, enjoy amazing fresh fish tacos (Maui style) and other fresh menu items. Coconuts is very casual so work out attire, jeans or even your PJ’s are all acceptable! They also have beer & wine and at least one good IPA on tap! NOTE: Food & drinks will be provided at the Meet & Greet on Friday and lunch at the Tailgate Party on Sunday. Breakfast daily, Saturday lunch, and dinners are the responsibility of the participants & attendees. To ensure we have adequate support, enough space, food & servers to accommodate our group at the various activities, we will send out an RSVP request at the beginning of January to all registered participants. **If you don’t have a vehicle for the weekend, it is your responsibility to pair up with someone for transportation to the ride locations & back to the hotel both days.